Interested in becoming a Mile-Hi Jeep Club Member? View our Membership tab for more information! The club encourages members to participate, on a voluntary basis, in search and rescue and other humanitarian missions the community needs. We have a strong and active contingent in the F.E.A.T. 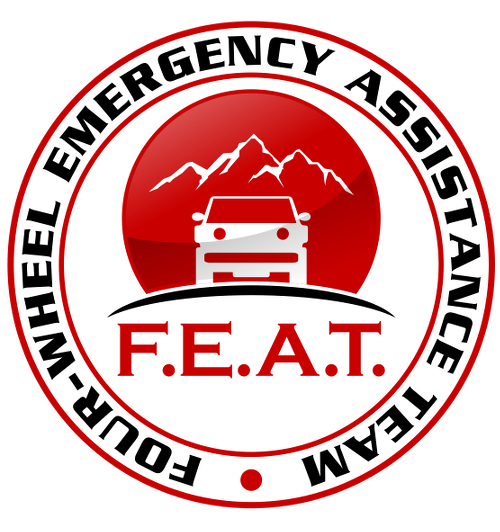 program in the Denver Metro area that aids emergency services in times of heavy snowfall to get to where they need to be. This includes getting doctors to hospitals to work their shift, getting patients to chemo therapy and the like so they can continue on their path to recovery, and rescuing stranded motorists when requested. One of the purposes of the Mile-Hi Jeep Club is to “Unite Adventure loving people in worthwhile 4-wheel drive activities”. One of the ways we accomplish this is through our public relations committee. Each year we participate in events such as the Annual Colorado RV, Sport, Boat & Travel Show, St. Patrick’s Day Parade, or other events around the state. These appearances are to promote the club and the sport of off-roading. We also participate in many fund raisers for Children’s Hospital and have raised over $125,000 in the last few years! Each December we participate in an event called the Christmas Caravan for Kids where Jeepers from all over the Metro area meet at different locations and caravan their vehicles loaded with toys to give them to members of our Armed Forces to take to the needy. Land use is near and dear to our heart in the Mile-Hi Jeep club so we try to participate in any fund raisers for organizations that can represent our interests in the impact of land use management. We are a very public organization and if your interested in helping please contact our Public Relations Committee Chairman. The club works to educate club members and the public on the methodologies of TreadLightly! and Stay the Trail and to act as ambassadors of our sport. We encourage good fellowship while operating our vehicles so we can preserve and protect the land for all generations, now and in the future, to enjoy. MHJC is also more than just a 4-wheel drive club. MHJC hosts special educational sessions throughout the year at the Parent Club Meeting, held the third Thusday of the month. Expect to learn more about your vehicle and its maintenance, as well as meet local 4-wheel drive vendors. In October or November, the Parent Club hosts the Raptor Foundation, bringing raptors to Parent Club and educating the club members about each bird. Mile-Hi Jeep Club was formed in 1956 as a social club to unite adventure loving people in worthwhile 4-wheel drive activities. Currently, the club has over 400 vehicle members that make up the 21 Patrols that are within MHJC. Each Patrol has an elected Patrol Leader that is on the Club's Board of Directors. There are three officers for the club that are elected by the membership each November. The Commander elect chooses his or her chairpersons for each committee in the Club. The club works to educate members in the proper and responsible manner of all road driving. The club works through various grants, internal and external, to preserve the natural beauty and terrain of our OHV roads and trails in Colorado. Several Patrols within the club have adopt-a-trail agreements with land managers to assist in this process. Mile-Hi Jeep Club has grown over the years, from its group of friends to over 400 members and their families! Leading the charge of the Parent Club is our Commander, who volunteers their time and dedication to shape our club to what it is today. Each November members of the Mile-Hi Jeep Club are nominated by fellow Jeepers for the “Jeeper of the Year” award. This award is given for one year to on of our members who showed dedication to the objectives and principals of the MHJC, land use, or other activities associated within the MHJC. The award is presented each year at our Christmas Dinner Dance. In order to become a Lifetime Member of Mile-Hi Jeep Club, a member must have 25 years of consecutive membership in the club. This is a list of all of the members that have ever reached this amazing achievement and the year they joined. Without all their dedication to make Mile-Hi Jeep Club the best Club around, it would not be the club it is today!